Precision, strength and flexibility... combined with an easy to use characterisation glaze. 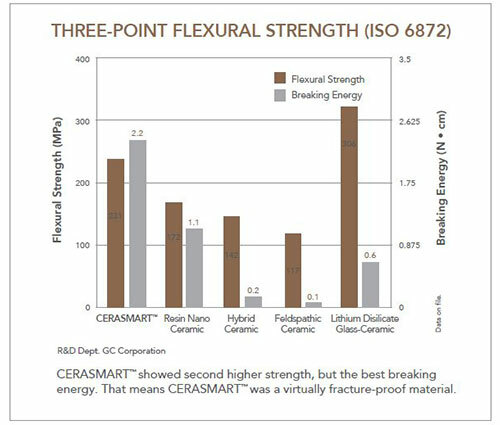 That's what CERASMART, the force absorbing hybrid ceramic CAD/CAM Block, stands for. It offers you unprecedented opportunities for a variety of clinical situations. Are you sure it's not ceramics? Characterisation is very easy using the wear resistant coloring glaze, OPTIGLAZE color: pre-treat, apply and light-cure to adapt the shade as much as you wish. GC recommends the use of CERAMIC PRIMER II for the pre-treatment of CERASMART. CERASMART blocks are CEREC® compatible and are listed in the latest CEREC® software update. CERASMART’s™ sharp margin adaptation and resistance to chipping ensures a long-lasting marginal seal. This unique hybrid ceramic is unsurpassed with its high gloss value, unique self-polishing capability, and its unmatched aesthetics.